It is not every day you find a place like Bivouac Junction. 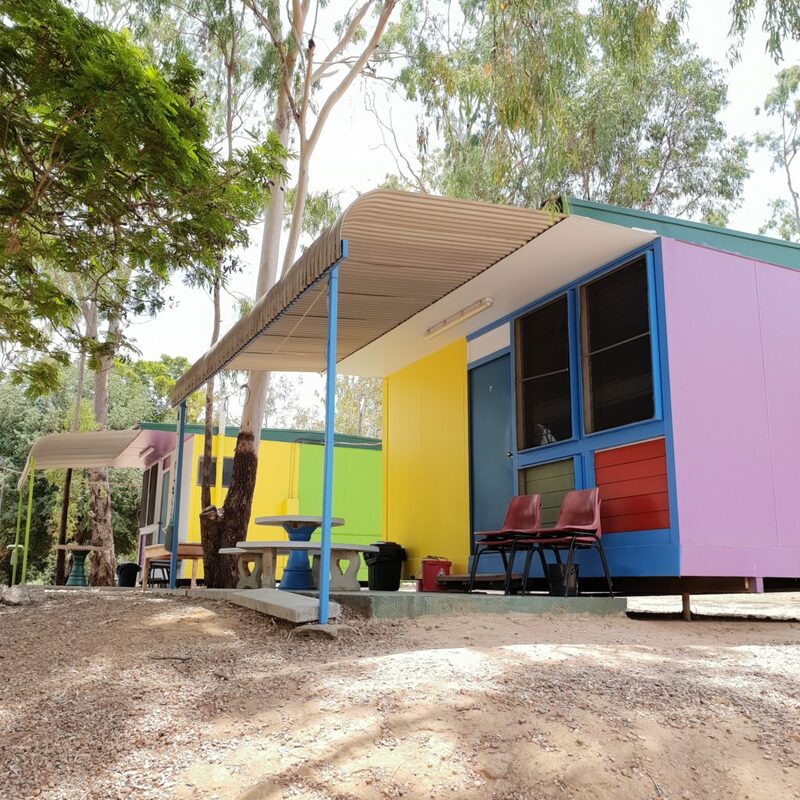 This endearing Holiday Camp on the banks of the confluence between two mighty Queensland rivers will find a special place in your heart too! Where on Earth is Bivouac Junction? 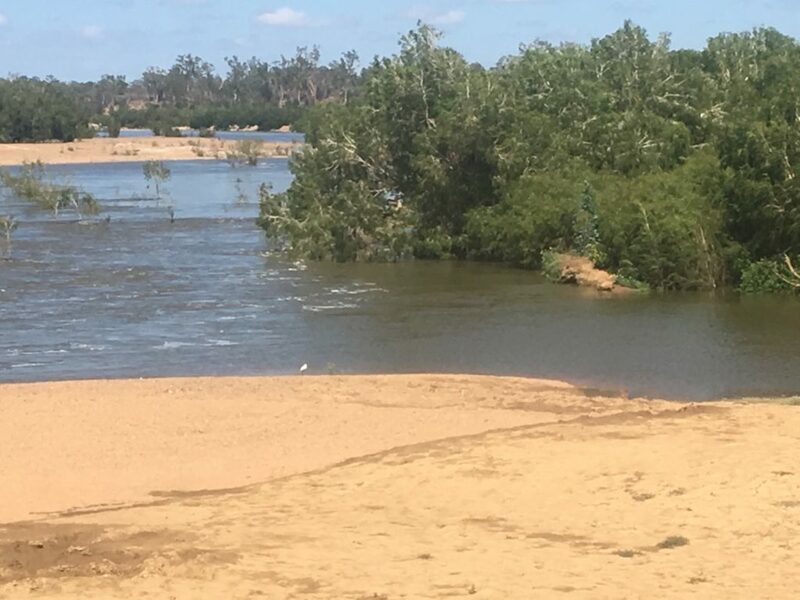 A stone’s throw East of Charters Towers in outback QLD, the camp sits right where the impressive Burdekin River is joined by the Fanning. 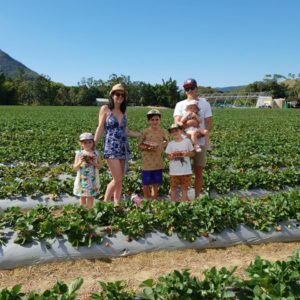 This is only one hour South of Townsville! It is easily accessible by sealed road right up to the driveway, then dirt for the last couple of kms after turning off the highway at Dotswood. As you wind through the coarse scrubland and dusty dales you wonder what you might find at the end! But suddenly you are amidst a literal oasis under tall trees with shaded patches of green grass and rainbow coloured outbuildings. 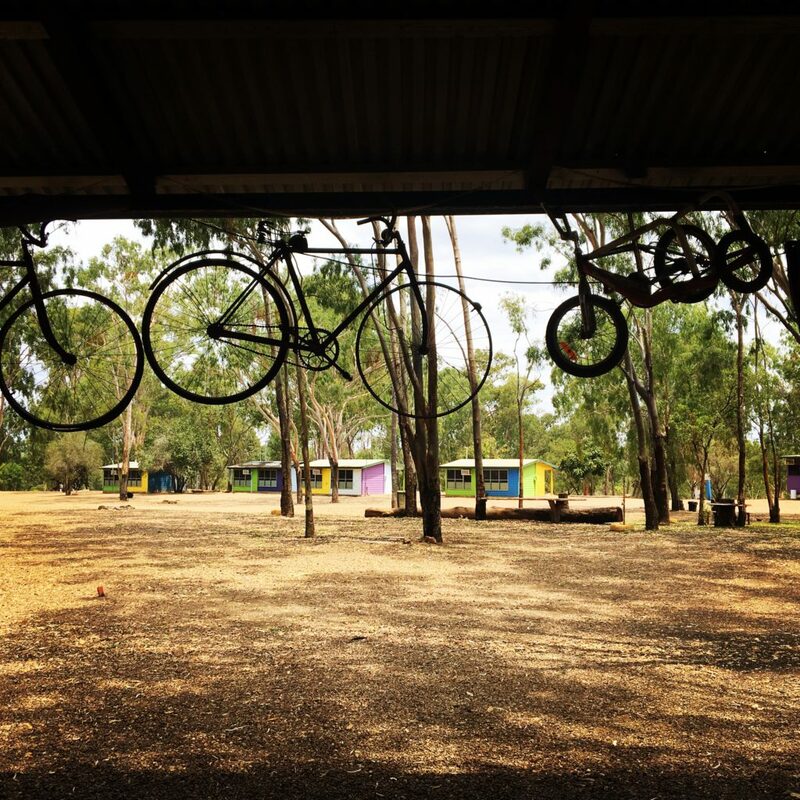 The amenities are fun, bright and well equipped with coin operated washing machines, beautiful hot showers, a camp kitchen housing all you need including fridge, kettle and BBQs, a massive undercover dining area great for groups with a central fire pit hootchie oven too. 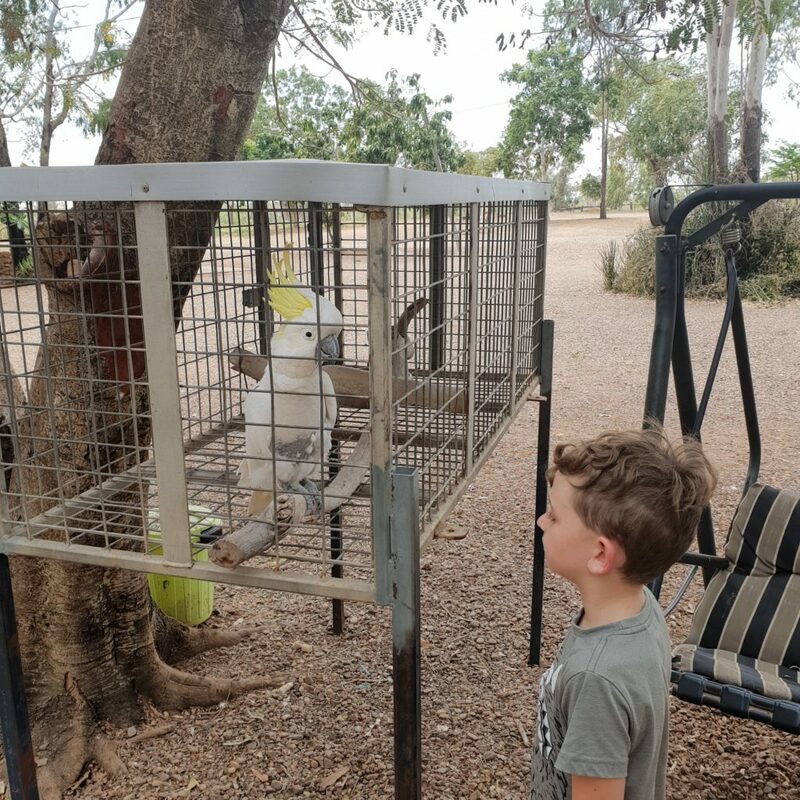 There are enough resident birds to keep you and the kids entertained including a talkative cockatoo, a disabled hen, and a plethora of beautiful peacocks which really sparkle in these surroundings. And they are just the campground locals. A mob of wallabies will lead you down to the waters edge and this is where the fun really begins! The ample camping space is spread over 2 generous levels. As you arrive, you can see the powered sites under a grove of the shadiest trees. This is where you also find the reception, amenities, camp kitchen, undercover area, swimming pool and the top tier is fringed by the 8 self-contained simple yet functional cabins. Stepping down onto the next level of floodplain is another unpowered section and this would be perfect if you were camping with a big group of friends or family. Great for events too! Speak to the manager if you want to book parties, weddings, or group get togethers. Catering can even be arranged! The Junction has even played host to a music festival in the past, but they couldn’t tell me if that was going to be a regular event. Being so close to Townsville means it would be a great venue. The unpowered riverfront sites are nestled along the banks of the 2 rivers at their junction. Depending on the river levels, there is ample room here but the prime spots under the trees at the water’s edge invariably fill up first! Hot tip: Get there as early as you can on Friday to have your pick of the sites for the weekend! 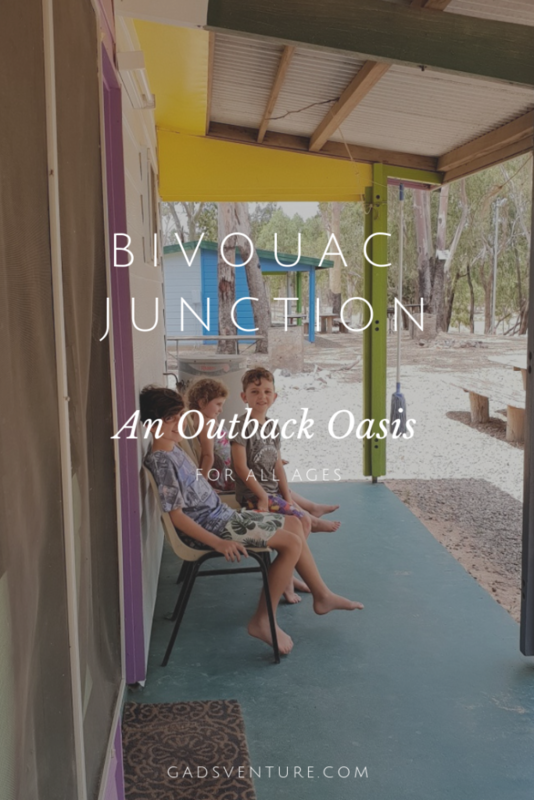 There are a range of very affordable accommodation options at Bivouac Junction which makes it a great choice for both short and longer stays. Unpowered sites are reasonably priced at $20 for up to 4 people. 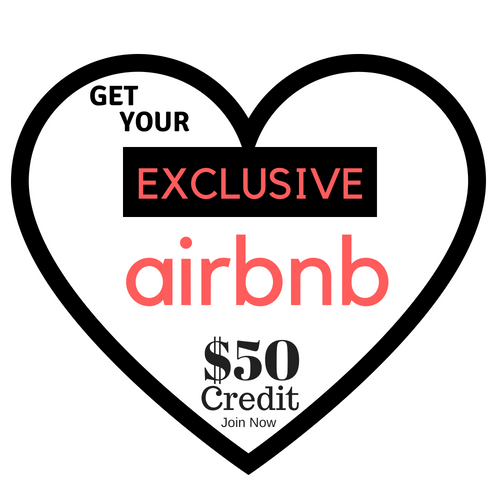 Powered sites will set you back $25 a night. There are 8 cabins which have a double bed and a set of bunks, a toilet and shower, air-conditioning, kettle, toaster and microwave. These cabins are cheap and cheerful, and are no frills but comfortable. You need to remember to bring your own linen though! Extra people can be accommodated, just ask when booking. The prices for cabins start at $70 for a couple. 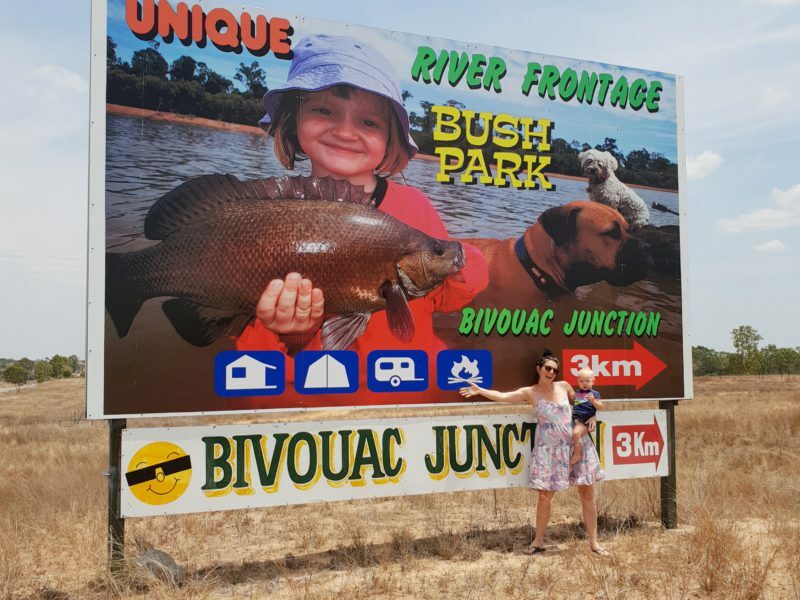 Bivouac Junction has what a lot of big fancy caravan parks lack, and that is its tranquility and ambience, with an overwhelming sense of belonging. 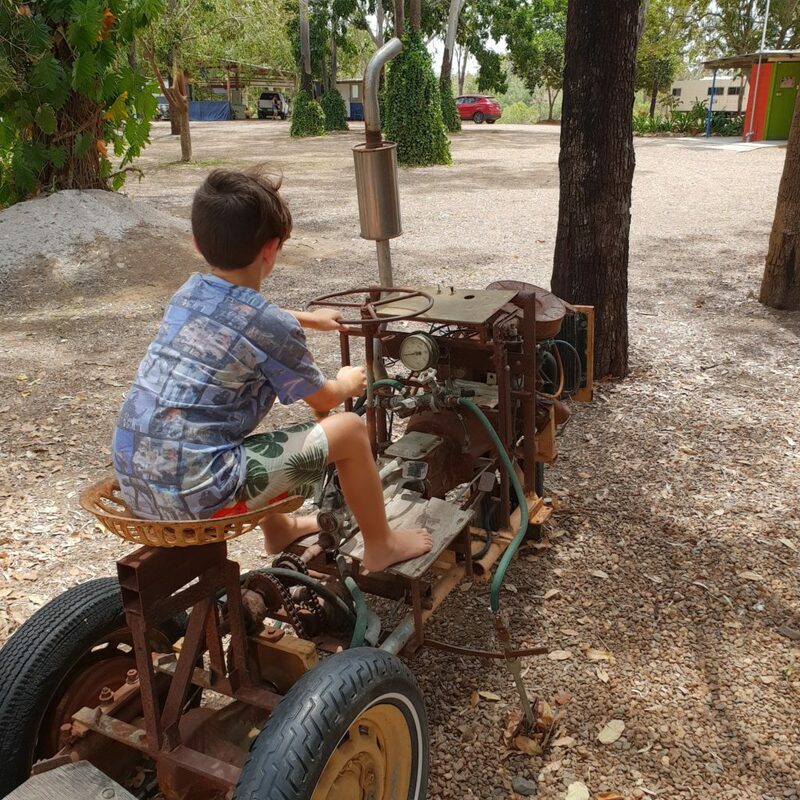 You really feel at one with nature here, surrounded by native bushland and animals and it is a great experience to relax and enjoy the special outback Queensland vibe. Generators are permitted during the daylight hours. Dogs are allowed, as long as they behave. Fires can be burnt in the firepits, and there is also firewood available to purchase. There are not many places around that tick so many boxes and provide such a wonderful and unique camping experience. 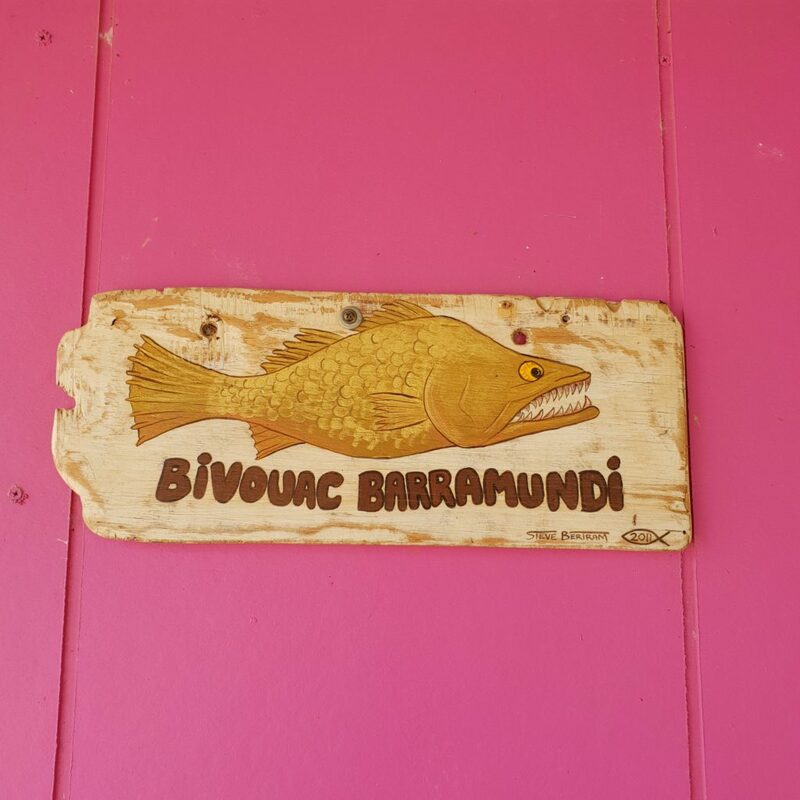 In season, barramundi can be caught in the river and there are opportunities for boating, kayaking, stand up paddling, and more. Just please make sure you watch younger kids as the river is not fenced! Sunsets are spectacular over the Burdekin River and a great way to enjoy an afternoon drink (or 2) with family and friends. There are no crocodiles, I am assured!!! If you prefer cooling off in the pool, you will find a lovely refreshing dip to be had on the upper terrace, near the powered sites in the tropical pool. 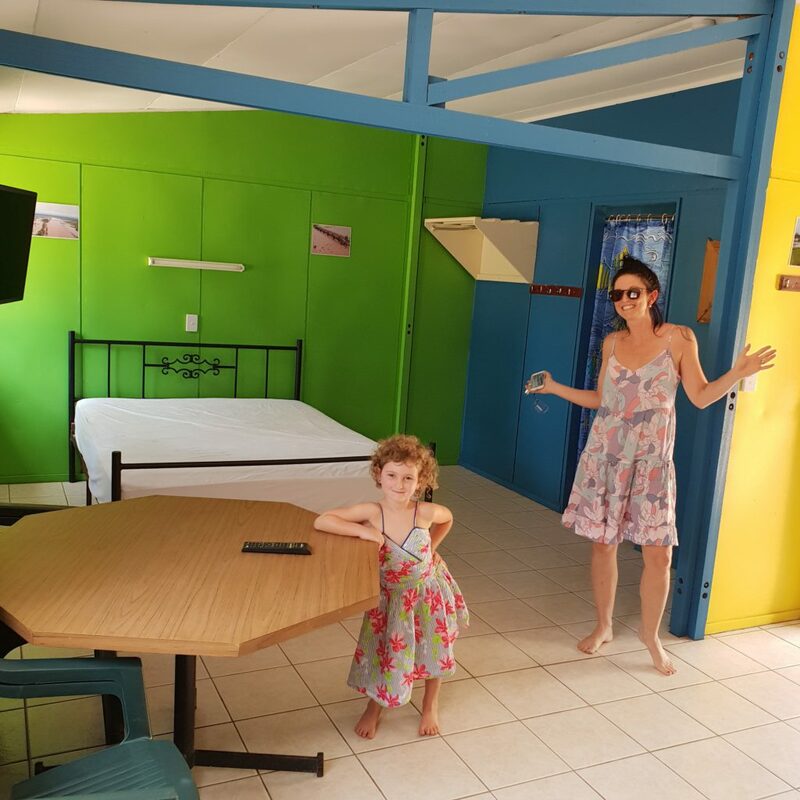 It is here that the outback oasis really earns its title as the Best Bushcamp in the Burdekin. Bivouac Junction gets 5 out of 5 stars for its service, friendliness and genuine old fashioned comfort. You will find you come for a night, and end up staying for a week. The relaxed atmosphere and beautiful surrounds really make you never want to leave! For more information on Bivouac Junction, check out their website here. They have a bookings hotline for cabins, see the website above, but sites are not booked thanks to there being so many attractive and spacious, powered and unpowered spots to park your caravan or pitch your tent. This review is not sponsored, but may contain affiliate links. See our Affiliate Disclosure for details. 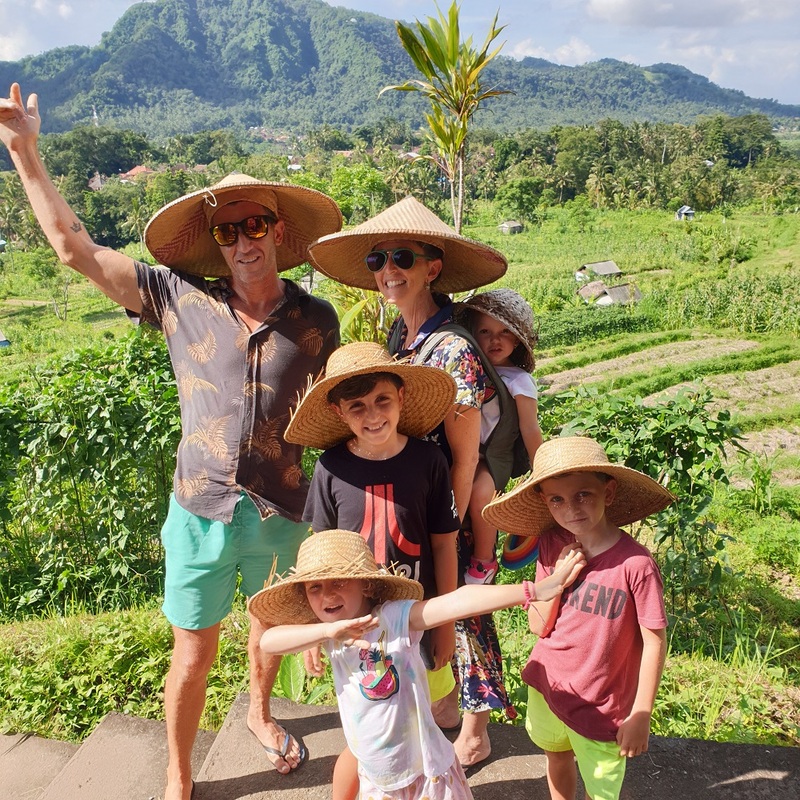 Give us a follow on Facebook or Instagram or leave us your email to get the latest on our informative blog covering all things family travel! If you have somewhere you would like us to review, check out our Work With Us section here. Has this post resonated with you? Why not give it a share!